This article starts where the previous one (Consuming Google (Reader) with .NET: Part 1 – Authentication) stopped. Before getting started it’s important to know that there is a site with plenty of information on the Google Reader API: http://code.google.com/p/pyrfeed/wiki/GoogleReaderAPI. But what we’ll also be doing is use Fiddler to reverse engineer the Google Reader API. When you visit Google Reader via your browser you’re basically always sending GET and POST requests. Using Fiddler you can then view the content of those requests. 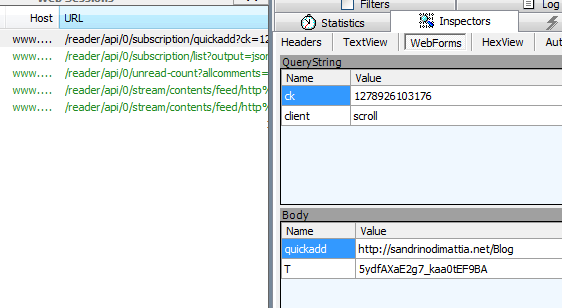 After pressing the Add button you can see that the url /reader/api/0/subscription/quickadd was visited and 2 fields were posted (quickadd and T). And for each available action in Google Reader you can use Fiddler to view the url and the post fields that are hidden underneath. If you take a closer look at the screenshot you see a field called T, this is a token. It identifies your session but expires quickly. That’s why you’ll see that our code requests a new token for each new request. /// Send a post request to Google. // Write parameters to the request. // Get the response and validate. This function uses a URL and GoogleParameters to build a POST request. And the token we talked about is also automatically included in the post fields. Thanks to this function we’ll be able to send POST requests to Google Reader with ease. Before really getting started we’ll just go and create a base class we might want to re-use when implementing other Google services. It encapsulates the authentication mechanismand the GoogleSession class. /// Creating this class will automatically try to log in and create a session. /// That way for each service we create we don't need to worry about the implementation of authentication and session. // Create a new session using this token. /// Clean up the session. When reading from Google Reader you’ll be working with 2 different types of data. Pure XML and syndication items. Syndication items (SyndicationItem in .NET) are actually items that come from a feed. For example, if you visit this site you’ll get a list of your read items in the shape of an atom feed: http://www.google.com/reader/atom/user/-/state/com.google/read. Each item in this feed is a SyndicationItem. /// Load the item (to be implemented by inheriting classes). /// Get the text from a TextSyndicationContent. /// Get a list of descendants. /// Get the value of a descendant. /// Base url for Atom services. /// Base url for API actions. /// Feed url to be combined with the desired feed. /// Label url to be combined with the desired label. /// Get the full url for a command. /// Get the full api url. /// Initialize the Google reader. /// Get the contents of a feed. /// Subscribe to a feed. /// Tag a subscription (remove it). /// Get a list of subscriptions. // Get the XML for subscriptions. // Get a list of subscriptions. /// Add tags to an item. // Calculate the amount of parameters required. /// Remove tag (for all items). /// Remove tag from a single item. /// Get a list of tags. // Get the list of tags. /// Get all items for a tag. /// Add state for an item. /// Remove a state from an item. /// Get the content of a state. /// For example: Get all starred items. /// Post a request using a reader command. /// Get items from a feed and convert them to a GoogleReaderItem. There you go, now you’ve got everything you need to get started with Google Reader in .NET. The following article will be about creating a basic WPF application to have a simple desktop version of Google Reader.